IRS Form 8889 or the "Health Savings Accounts (hsas)" is tax form released and collected by the United States Internal Revenue Service. The January 1, 2017 fillable version of the 8889 Form can be downloaded below in PDF-format. The IRS-issued "Health Savings Accounts (hsas)" is available for digital filing or can be filled out through the Adobe Reader application on your desktop or mobile device. 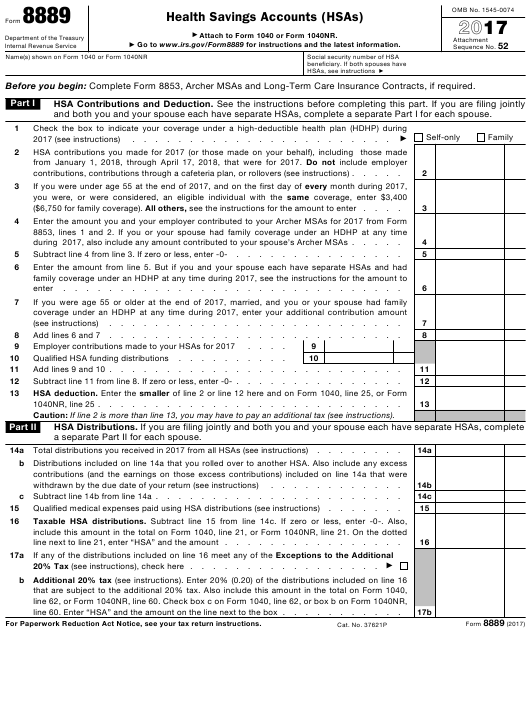 Attach to Form 1040 or Form 1040NR. Go to www.irs.gov/Form8889 for instructions and the latest information. Before you begin: Complete Form 8853, Archer MSAs and Long-Term Care Insurance Contracts, if required. and both you and your spouse each have separate HSAs, complete a separate Part I for each spouse. contributions, contributions through a cafeteria plan, or rollovers (see instructions) . ($6,750 for family coverage). All others, see the instructions for the amount to enter . during 2017, also include any amount contributed to your spouse’s Archer MSAs . Subtract line 4 from line 3. If zero or less, enter -0- . Add lines 6 and 7 . Add lines 9 and 10 . Subtract line 11 from line 8. If zero or less, enter -0- . Caution: If line 2 is more than line 13, you may have to pay an additional tax (see instructions). a separate Part II for each spouse. 14 a Total distributions you received in 2017 from all HSAs (see instructions) . c Subtract line 14b from line 14a . Qualified medical expenses paid using HSA distributions (see instructions) . line next to line 21, enter “HSA” and the amount . 20% Tax (see instructions), check here . line 60. Enter “HSA” and the amount on the line next to the box . complete a separate Part III for each spouse. Qualified HSA funding distribution .